Snake Boat race is stated to be the sport event having the highest number of members in a single team. Usually, a snake boat is manned by four helmsmen, 25 cheerers /singers and 100-125 oarsmen, who row in unison to the fast rhythm of `vanchipattu'or boatmen's song. The snake-boats, it is said, have its origins in Alappuzha with a history of over 400 years when kings of erstwhile Chempakasseri (Ambalappuzha), Kayamkulam, Thekkumkoor (Changanassery), and Vadakkumkoor (Kottayam) fought battles on these boats in the backwaters of Kuttanad. 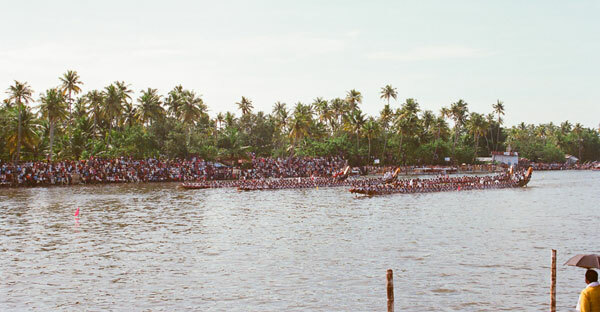 The snake boat racing season in Alappuzha district begins in June/july. Indira Gandhi Boat Race,on the Ernakulam Lake during the Cochin Carnival in the last week of December.